Just a question about how to play a character that frequently runs with Rebels, Jedi, and other characters outside of Edge of the Empire. If I made a character that supports the Empire, which is under Causes in Edge of the Empire. How would that work when every event that is played has a mixture of all the different core books at one table? I'm not saying that I want to make a character like this. But if a character every once in a while, for their own ends, does something to help the Empire, while there are rebels and Force users around, how would this work, if at all? Basically all of this is encapsulated under the "Disruptive Player" rules. There is technically no rule that says you can't play a character who sympathizes with the Empire, but if you constantly do things that sabotage the adventure or get other characters into trouble in such a way that the players feel their fun is being ruined by having that character in their party instead of as an enemy the disruptive player themselves can be asked to leave the table after 3 warnings. Also with the Faction system in Season 2 characters might be bound more specifically to various groups that are part of the Legends of the Galaxy greater narrative, so these completely free floating characters who have no link to the story other than the player dragging them to the table might no longer be a thing. The factions rule is a helpful rule to focus people's obligation and duty to make it easier for GMs. However, Players can still choose their own and not follow the factions. I am all for characters that support the Empire. It brings forth character building as well as opposed character action, not all people get along and therefore seems strange to make everyone's characters get along as well. Then again I am an Imperial at heart. Who says Imperials can't be heroic? The Rebels are "Good", the Empire is "Evil" because of their leader. Yet the Empire brought order from the chaos of the clone wars, so to many this can be viewed as "Good" while the Rebels can be viewed as "Evil" because of the terrorist tactics they use. I mean they also murdered Millions of people when they took out the Death Star. Both sides are good and evil, it depends on your point of view. Ehhh, the second you try to do good by committing genocide your moral high ground very quickly disappears. That can be said for both sides. I guess I asked this question because we are playing a role. A character that should have a personality and a feeling of realness to them. During any conflict, it's hard to distinguish who is good and who is bad. A stormtrooper could be heroic by saving a family from being shot, or choosing not to follow an order as it goes against what he is fighting for. 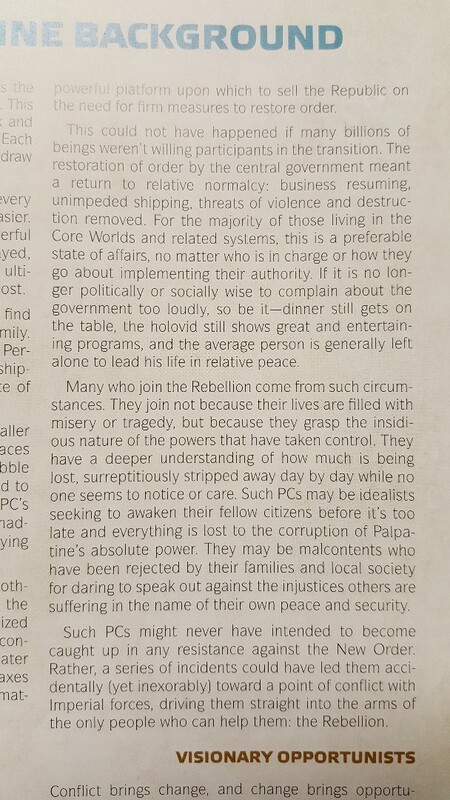 I totally understand that this system is designed around the Rebellion, Jedis, and Scum, but more than likely, even people who live in Rebel supported areas may not actually support the Rebellion. Edge of the Empire would almost certainly not care about either side as they are out for their own gains. I guess I'm wondering, if I were to support the Empire, that would potentially be disruptive, but if I played a fanatical Rebel soldier, that would be okay. So, how do I make a character that doesn't agree with everything that's going on in the adventure, or flat out won't do some of things that are happening as it would go against their personal beliefs. More to come as I think about it longer. I think you mis understand. You can have beliefs that are pro imperial. Where it becomes disruptive is if those beliefs make you betray the table turning then over to the empire this ruining other people's experience. Yes, this is an organized play and you are playing a role. But if you take an Imperial loving character you would not be playing a game where you sit in a Rebel briefing room taking a Rebel mission unless you are a spy. If you being a spy means you are going to do things to hurt the table then that is disruptive to the organized play as you choose a role that is contrary to the game in question. If you are playing Edge and love the empire who cares. If you play force and love the empire who cares. But if you play a Rebel game you run into an issue. That is kind of what he is talking about, it seems everyone has gotten off the original question. He wants to know how he could do it IF he wanted to do it since there are people who play Age of Rebellion characters. Age of Rebellion is/should be strictly Rebels, yet like I run more Edge of the Empire stuff, so he could make a character that does support the empire. It may piss off Rebel characters, but guess what, not everyone believes in the Rebellion. I'm just gonna settle this right now. In the Age of Rebellion core book, Step 1: Determine Background, page 43, Relationship with the Empire. It clearly says that billions of people are willing to be part of the Empire. It clearly says that the majority of the galaxy is okay with them ruling as long as their lives aren't impeded, which they aren't. So, to have a character simply support the Empire (not being evil or fighting for them, just accepting them as the government that brought order from chaos) is more normal than a hero that hates the Empire and fights them. Lol, guys, it isn't a big deal. It's real. It's life. That's what will happen. And if he wants to support the idea of them, but doesn't want to fight with them or even wants to leave the empire because they later decide it's horrible, that player can play without playing for the Empire. It's not that big of a deal, it makes sense, it's in the book. XD Come on, guys. Relax. It's just a game. If you don't associate the Sith with the Empire, which is only a thing because Palpatine was a politician with aspirations of political power. Then it's just an army that has brought order from the disruption of the Separatists. Currently I am running a character that works for Black Sun, the Besadi Hutt Kajidic, and as a result is a supporter of the Galactic Empire. No one gives me trouble. Now I choose to not do Age of Rebellion missions with my character. At least not yet. My character eventually in their story may go undercover and infiltrate the Rebellion. I would leave it up to other players to convince me of the error of my character's ways. If they don't and if I choose not to believe them I will continue to be my Empire supporter.